Quilted winter parka made of intricately patterned functional material that reliably protects you from wind and rain! 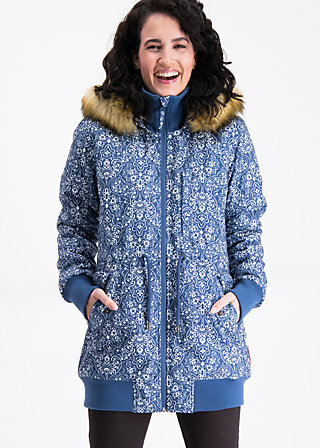 Highly recommended: The beautiful jacket has a water column of 8000 mm, is equipped with soft fleece lining, snug cuffs in colour harmonising rib knit on the sleeves, collar and hem, as well as a cosy hood with removable faux fur. The practical length to the hip promises freedom of movement and also keeps crisp air at bay. A width-adjustable drawstring at the waist height enables individual wearing comfort and guarantees a great fit. A zip pocket at breast height and two large, piped pockets with snap button closure complete this warming gem with more practical gadgets. A soft chin protector, cosy fleece lining in the hood and pockets and a playful artificial leather patch on the left upper arm show that this Blutsgeschwister creation was thought out with a lot of love down to the smallest detail! The fabric “dutch-ornamental” can be easily combined with those fabrics.